It was too cloudy for sunset picture, so I decided to just focus on the river, taking long exposures. 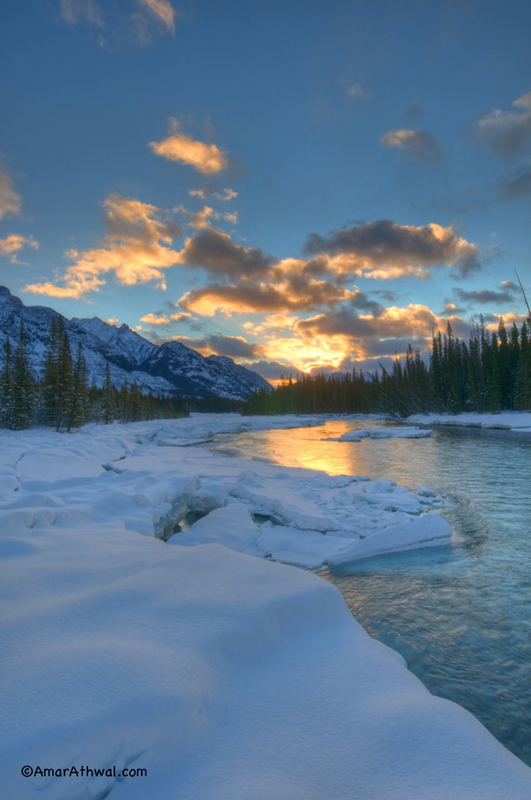 I was up the Bow River from the town of Banff, looking to get pictures of Massive Range during sunrise. The light reached the peaks but due to lack of clouds, the picture was rather plain. But when I turned around I saw a better picture, I set up the camera again and got the picture. Massive Range will have to wait a another morning. The calm and the power of nature. 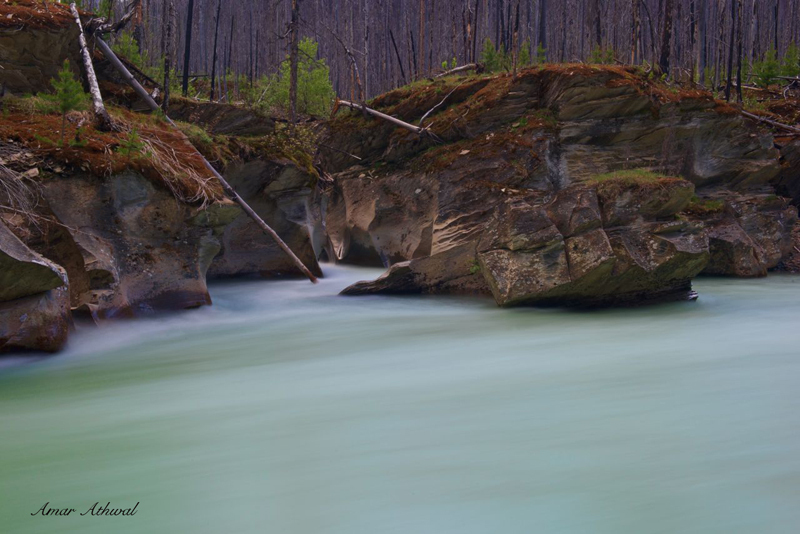 Was in Kootenay National Park taking long exposures of part of Vermilion River. I waited until it was end of the day. The hard part is what to include or what not to include in the picture and how long to make the exposure, it a nice way to be creative. Spent some time in the morning along the river taking 8 to 10 seconds exposures. In another week the water will be going over this rock, this morning I wanted to see the shape of the rock created by water and sediments in the picture. I was exploring the Upper Waterfowl Lake area, getting some exercise and enjoying the solitude. Was seeing various indicators on the snow of wildlife, but nothing fresh and definitely nothing moving front of my eyes. I kept walking and kept exploring as I moved away from the lake and started to walk along the Mistaya River. It was a cold morning and moving was important, but plans changed when sunlight started to streak through the dark low clouds. The light was low and was causing long shadows, a photo opportunity. I rushed to locate a place to take a picture before the conditions changed. The light was coming through the clouds, mountains in view, calm flowing river and ground covered by snow, with grass covered with frost was going to be my grounding subject. It was time to take a picture. Got low to the ground with the camera and the tripod and took the attached picture. Then it was time to explore more. I was standing next to the Bow River, waiting for the early light to hit the top of Pilot Mtn. I waited and waited and the light never came as planned. The clouds kept the light away form the peak. The view looking in the direction of the sunrise was not too bad, so I pointed the camera in that direction and took the attached picture. Working with nature as the subject, things often don't go as planned, but there are always other options provided. Time flies, not sure where May went and we’re already third of the way into June. The last few weeks with the on and off rain, I been thinking about taking a picture where the water is the main subject. Few months back I was in Kootenay National Park, checking out the Vermilion River. Took some pictures then but wanted to get back there for more. Most of the time I take long exposures of the water during the early hours, this time it was going to be at the end of the day. I was by the river where creek enters into it, moving from side to side framing the picture in my head before setting up the camera. I took about several pictures, but the last few stood out. The one attached was exposed for about 20 seconds, giving a cool blue feel to the image. I'm alway looking for new places to take pictures of the same mountain. Spend lot of time with maps, looking for spots along trails, rivers, lakes. etc.. I'll always be taking pictures form the well known locations, but when I find that not so well know location to take pictures from. I not only get a picture with a unique view, but learn how diverse and unique the mountains are. Each mountain, each valley, each river, each lake has many stories to tell. You just need to spend the time exploring. I was exploring the Cascade River below Minnewanka Lake, river's power was greatly reduced with the three dams built since 1895 along Minnewanka. But it still plays an important role to it's surrounding and the many life forms that rely on it. I came across the Cascade Power Plant that was built in 1912 and closed in 1941. Saw the beautiful fall that friends had told me about. But also another spot to capture the beauty of Cascade Mountain.